ProCharger High Output Intercooled Tuner Kit Supercharger Chevrolet Avalanche 5. Intercooled ProCharger systems deliver the ultimate performance and power increase for towing, daily driving and sport truck applications. Compared to all bolt-on aftermarket superchargers, ATIs superior technology delivers more low-end torque and substantially more total power than any other supercharger system. In the lower rpm towing range, Intercooled ProCharger systems will deliver more rear-wheel torque because the intercooled charge air is extremely dense (virtually at ambient temperature), the engine is running full timing, and the P-1SC consumes far less power than positive displacement superchargers. 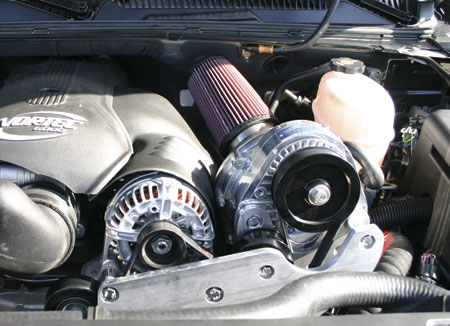 At mid-range and higher rpm, in addition to making more power per pound of boost (due to the same combination of greater air density, full timing and less parasitic load), an Intercooled ProCharger system is also able to safely produce more total boost, thanks to the coolest charge air and exhaust gas temperatures in the industry. The net effect is a substantially larger increase in air density, which in turn produces a substantially larger increase in power. History and physics show that applications without intercooling must run unsafe boost levels or octane-boosted fuel to perform even close to an Intercooled ProCharger system. Superior Efficiency and Fuel Economy: Intercooled ProCharger supercharger systems enable your truck or sport utility to deliver unparalleled performance without sacrificing daily drivability or gas mileage. In fact, unlike inefficient positive displacement superchargers, in most towing applications your gas mileage may actually increase slightly thanks to the superior efficiency of the P-1SC ProCharger. Stock or modified, for towing, daily driving, or racing, Intercooled ProCharger systems deliver far more performance with far greater engine reliability than any other supercharger system or power adder such as nitrous oxide. The Best Engine Reliability and Drivability: ATI introduced the industrys first intercooled supercharger system nearly 3 years before its nearest competitor, and is the only company that offers air-to-air intercooled supercharger systems for trucks and SUVs. Other companies non-intercooled and air-to water supercharger systems are typically tuned at the edge of detonation, which leaves you little margin for error. However, because air-to air intercooling removes the heat which causes detonation, you can safely run far more engine-friendly intercooled boost with full timing and complete peace of mind. With air-to-air intercooling, there is no need for "band aids" such as ignition retard, over-rich or auxiliary fuel injectors, or water injection. There is also no need to buy exhaust gas temperature (EGT) gauges because intercooling means that exhaust and overall engine temperatures remain stable even during extreme towing, racing and/or summer heat conditions. The intercooler system, which is standard equipment, simply rejects far more heat than it will receive from the highly efficient P-1SC ProCharger. Intercooling is clearly the fundamental solution for reliable high performance, because it substantially improves both engine reliability and power output. That is why intercooled forced induction is the high performance technology of choice for millions of factory OEM vehicles worldwide. - Inlet Hose Diameter: 3.75"
Std Intercooler: 2 core. Call for other specifications. -Model year must be specified below. -Due to variability among OEM computers and the prevalence of custom modifications, dyno tuning may be required. Thanks to relentless innovation, ProCharger technology is generations ahead of the competition. ProChargers are the only superchargers to incorporate billet impellers in production models. Our exclusive, patented, self-contained, gear-driven centrifugal superchargers eliminate tapping into your oil pan, run cooler and produce more power than any of our competitor’s supercharger kits. Our standards for quality and durability allow our customers to have peace of mind knowing they have the best built superchargers with the best warranty in the industry. Unless otherwise noted, ProCharger kits for fuel-injected applications meet both EPA and CARB emissions requirements and are classified as 50 state legal.